Top Democrats encouraged the Justice Department's top ethics official to disclose whether he thinks newly appointed acting Attorney General Matthew Whitaker should recuse himself from overseeing the Russia investigation. In a Sunday letter signed by Democratic lawmakers Nancy Pelosi, Chuck Schumer, Jerry Nadler, Dianne Feinstein, Adam Schiff, Mark Warner and Elijah Cummings, Whitaker should be disqualified from taking control of the special counsel investigation over comments he made in June and July, 2017. "Mr. Whitaker has a history of hostile statements toward Special Counsel Mueller's investigation, including televised statements suggesting the investigation be defunded or subjected to strict limitations in scope," reads the letter, pointing first to a June 9, 2017 statement by Whitaker during an appearance on a radio show in which he said "There is no criminal obstruction of justice charge to be had here. The evidence is weak. No reasonable prosecutor would bring a case." Then, in a July 26, 2017 statement, Whitaker said that he "could see a scenario where Jeff Sessions is replaced with a recess appointment and that attorney general doesn't fire Bob Mueller but he just reduces his budget so low that his investigations grinds almost to a halt." The letter goes on to note that Whitaker has referred to the special counsel investigation as "a mere witch hunt," as well as an opinion article he wrote entitled "Mueller's Investigation of Trump Is Going Too Far." Neal Katyal, former acting solicitor general of the United States under President Obama and architect of the special counsel rules, which he drafted 20 years ago under President Clinton, says in a Monday Washington Post article that Whitaker's appointment is unconstitutional. Even if Whitaker’s appointment ever survived a court challenge on constitutional grounds for most of his day-to-day duties at the Justice Department, the fact that he’ll now be performing the sensitive work of supervising Robert S. Mueller III’s investigation raises other deep problems. Putting Whitaker in charge of the inquiry is sharply at odds with the special counsel regulations governing Mueller’s work and with the Justice Department’s rules about who may oversee an investigation. Katyal goes on to argue that the President should not be able to "name his own temporary attorney general to supervise an investigation in which he and his family have a direct, concrete interest," and that "The Constitution itself underscores this — even assuming Trump’s defenders are right that under the Appointments Clause, an acting attorney general doesn’t always need to be Senate-confirmed." Moreover, Kaytal points out another problem specific to the Mueller investigation. "In an emergency situation where an acting head is named, the president is, ultimately, the responsible official who supervises temporary, unconfirmed stand-ins. The idea is that there would at least be someone accountable to the public above the acting officer in those situations — and as Harry Truman put it, the buck always stops with the president." 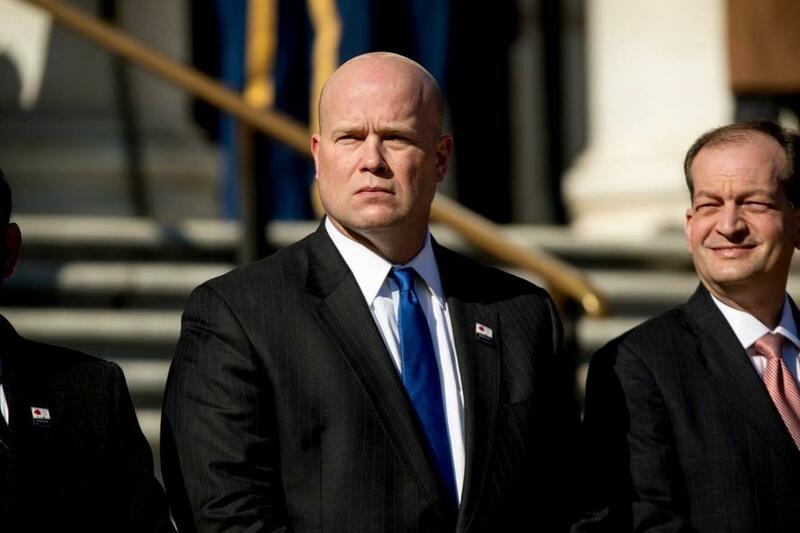 Whitaker, Kaytal argues, is compromised, while Justice Department ethics rules "forbid someone from participating in a criminal investigation if they have “a personal or political relationship” with “any person … which he knows has a specific and substantial interest that would be directly affected by the outcome of the investigation." This "fits this case to a T," since Whitaker campaigned for his job both publicly and privately - while casting doubt over the legitimacy of the Mueller investigation. Whitaker also ran a political campaign for Trump confidant Sam Clovis - who Mueller subpoenaed as part of his Russia inquiry. Given that Democrats are likely to suggest that the Mueller investigation has been hobbled by Whitaker, will he recuse?